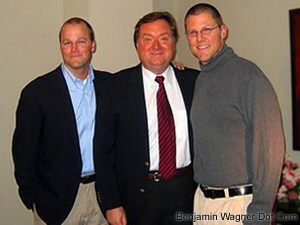 The New York Times just confirmed some sad news: Tim Russert has died of a heart attack. We scored the interview courtesy of my uncle, with whom Tim had worked for years, after I read Tim’s wife, Maureen Orth, remembrance of Mister Rogers in The Nantucket Inquirer-Mirror some months earlier. It was a cold, drizzly Monday morning as we pulled into NBC’s Washington, DC, bureau. Despite a fair dose of preparation, I felt exceedingly nervous. Here I was — some kid from Iowa — interviewing on of journalism’s foremost interviewers. Worse, it was only Chris and my third shoot, and one that had to take place under challenging circumstances; we had just fifteen minutes to get what we needed. We were ushered through the lobby by his assistant, Lisa, past the “Meet The Press” set, to a large, off-white, windowless conference room dominated by a huge, oak table. Chris and I quickly conferred on our set up, and tossed up our two lights — one of which was missing its bulb. Moments before one of the biggest interviews of my life, I dashed through the rain to the car for a replacement. I was pacing the conference room when Tim finally walked in. Please visit “Making ‘Mister Rogers & Me’ to read the rest of this blog post. “Are you chewing gum?” Jason asked. “I might be,” Mike responded. And so it was that The Nadas began another New York City performance. Were Des Moines’ favorite sons on their home turf, the room would be spilling forth with fans. 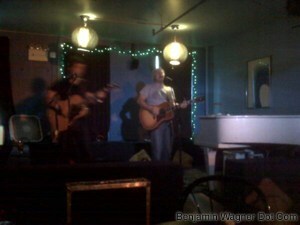 Last night, though, the founding duo, Mike Butterworth and Jason Walsmith, was performing an intimate acoustic set at New York City’s venerable Living Room on the final night of a quick swing through the East Coast that included Philadelphia’s World Cafe and Washington, DC’s Kennedy Center. The set began with a plaintive version of “The Deal,” a great song that — on this night, 1500 miles from home in front of an audience of sixteen (including the sound guy, waitress, next performer and her two friends) — was difficult to divorce from the subtext of its lyric (“I just wanna’ do one thing right / To know how that feels”). “Blue Lights” also sounded lonesome, sadder even, without the whiskey-fueled band. “Dancing Lucinda,” a young blond in the front row chimed in as if on cue. As Mike and Jason played a beautiful, melancholy version of the song, I stole a glance of the young requester. Her eyes were wide and bright like only an Iowan’s can be. Her memories of the band, her friends and everything she associates with the song — summertime, first love, skinny dipping — flashed a cross her face. And when they finished, she clapped louder than anyone, smiling ear-to-ear. “So what did you want to do?” Jason asked Mike. But they did, grinning through the missed chords. And it was great. Likewise “Templeton Rye” and “Lullabye,” requests both. And then the shots showed up. Which is the moment, I imagine, that this room full of transplanted Iowans really started feeling homesick.